With all of the key players that are out injured for Arsenal in their Premier League fixture at Huddersfield Town this weekend it looks like Denis Suarez has a very good chance of starting his first match for Arsenal. The midfielder acquired via loan from FC Barcelona was the Gunners’ only acquisition in what was a very quiet January transfer window. Suarez helps to fill the need for depth in midfield, but the Gunners still have an injury crisis in the back to contend with. Manager Unai Emery will have to be creative with his selection there. The Premier League weekend’s headliner fixture sees fourth place Arsenal visit second place Manchester City, in match-up of the fourth place team visiting the side that is second in the table. Pep Guardiola’s team shockingly lost at lower table Newcastle United in midweek, and with Liverpool drawing against Leicester City, fell another another point off the pace of the league lead. Let’s see how they respond on Sunday. Here’s the injury and fitness situation for both sides in this blockbuster match. It’s official- Arsenal have acquired FC Barcelona midfielder Denis Suarez on loan; meaning he’ll be reunited with his former manager at Sevilla, Unai Emery, for at least the rest of the season. Arsenal’s securing a deal for the 25-year-old Spaniard comes on the second to last day of the January transfer window. As we move into the final hours of the transfer window, it appears that the north London side’s other major target, Inter Milan winger Ivan Perisic, will not be coming over to the Emirates. As part of the deal to go on loan, Suarez also extended his contract with Barcelona. According to the BBC, Arsenal are looking to acquire two players, both via loan, before the January transfer window closes next Thursday. While they certainly have an injury crisis at the back to contend with right now, they are not currently really being linked to any defenders. Instead it’s Barcelona midfielder Denis Suarez and Inter Milan winger Ivan Perisic that are the north London side’s top targets. And with reports circulating that the Gunners are closing in on Perisic, Milan boss Luciano Spalletti has made remarks that have opened the door to this deal likely getting done. 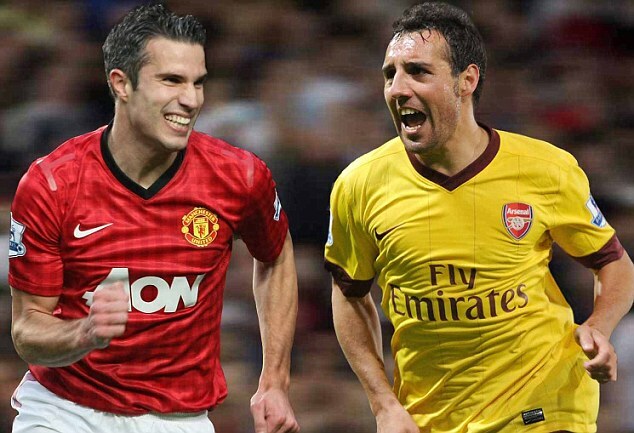 Friday night sees Arsenal FC host Manchester United in the weekend’s headliner fixture- a fourth round FA Cup clash. We’re also in the last days of the January transfer window, so there’s a whole lot to talk about on that front too. Let’s dive right in with today’s edition of Arsenal news, notes and transfer talk. We start with forgotten midfielder Aaron Ramsey, who is reportedly set to join Juventus in the summer once the season is over. Premier League champions Manchester United have defeated league leaders Arsenal by a goal at Old Trafford. Courtesy of a sublime header by Robin Van Persie, United have reduced the gap at the top of the table to 5 points. Stateside it’s easy to think of professional soccer as being on the lower end of pro sports profits. But step outside the USA and you’ll quickly see that the sport of the world generates billions upon billions of income annually. A goal by Aaron Ramsey in the 92nd minute gave Arsenal a 1-0 victory over Marseille at the Stade Velodrome in the Champions League to send them to the top of Group F.
In what was for the most part an uneventful match where neither team had a clear scoring opportunity, substitute Ramsey popped up to score on Marseille goalkeeper Steve Mandanda’s near post in the dying minutes. For each team the best chances to score were on missed handballs in the box. In the first half Marseille had a legitimate shout for a penalty when Arsenal’s Carl Jenkinson handled the ball in the box. At the other end, Arsenal nearly scored from a Robin van Persie header from a corner kick, which was cleared off the line. Yet on the same corner Souleymane Diawara for Marseille handled the ball prior to van Persie’s header.